S5 0716+71 is a bright and violently variable BL Lac object in Camelopardalis. 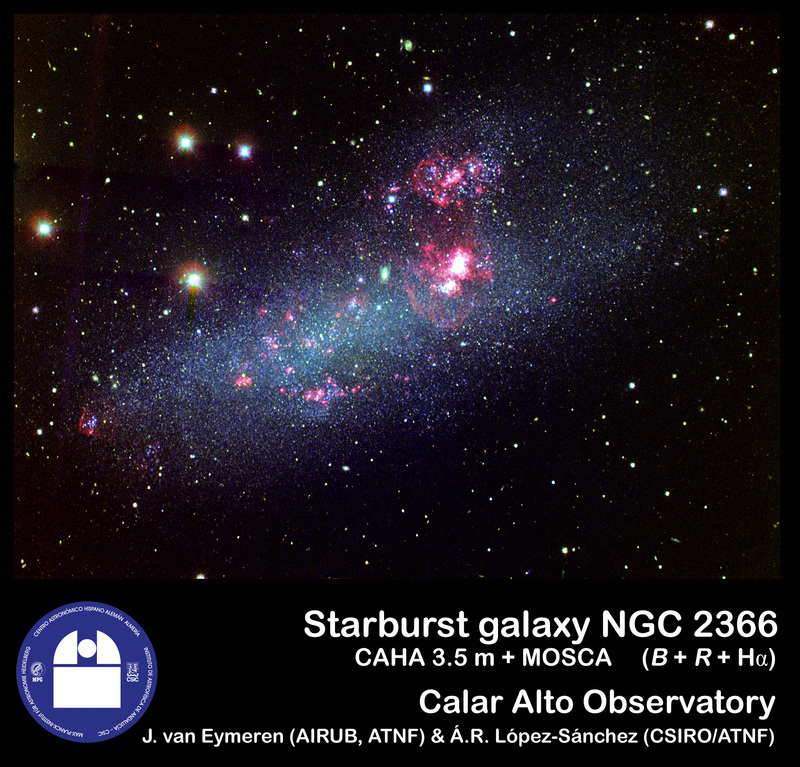 Its position lies about 3.4° NE of star 43 Cam, and 2.2° N of irregular galaxy NGC 2366. S5 0716+71 was discovered as a radio source in 1977/78 during the 5 Ghz Strong Source Survey (S5). Follow-up spectroscopy clearly identified S5:0716+71 as a quasi-stellar object. Today, S5 0716+71 is classified as a BL Lac object due to its (nearly) featureless spectrum, rapid variability and strong optical polarization. The first accurate redshift measurement for S5 0716+71 was published in 2008. Besides the optical and radio, this blazar also has been kown as an emitter of infrared (IRAS), X-ray (1RXS, 1H) and even gamma (TeV) emissions (2EG, GEV, EGRET). The host galaxy itself has an apparent diameter of 5.4 arcsecs, which corresponds to a true size of only about 12 kpc. Blazar S5 0716+71 is a violently variable object with a total optical range of more than 5 magnitudes! An exceptionally bright state in the optical was reported in January 2015, when the blazar reached 12.06 mv - the brightest magnitude for this object ever recorded. On average, brightness varies between 13 mag and 14 mag. Due to its exceptional brightness, this blazar is an easy task for visual observers with telescopes of 8- to 10-inch of aperture, at maximum even for 6-inch telescopes. The object appears stellar even with large apertures. Without a go-to mount, tracking down blazar S5 0716+71 may become a little tricky as it lies in a region lack of brighter stars for easy starhopping. Both CCD observers and visual observers shall use the comparison stars given above. The comparison stars 4=13.55 and 5=13.63 are recommended for both unfiltered and v-mag photometry. Another photometric sequence was published by Nesci et al. (2005). Note: The data point of 12.27CV in the light curve above was CCD imaged by Manfred Mrotzek (Ger) on Jan. 17, 2015, 23:10UTC. Manfred kindly provided his images for photometric reduction, carried out by the author. When you are around for S5 0716+71, do not forget to visit the irregular galaxy NGC 2366 only 2.2° S, a low surface brightness galaxy and member of the M 81-galaxy group. 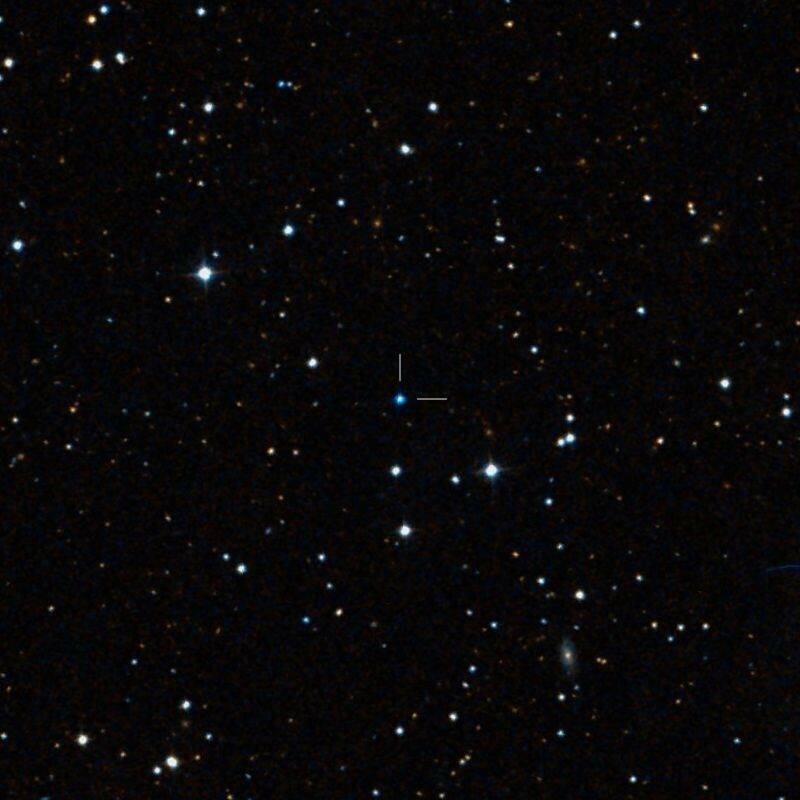 Far beyond the M 81-galaxy group, and some 5° SW of S5 0716+71, another quasar is ready to be observed: HS 0624+6907. This is a bright 14-mag object at a distance of about 3.9×109 light-years. An All-Sky Network of faint stars calibrated on the Landolt System. Quasaren und BL Lacertae Objekten; Frankfurt 2005. Katajainen, S., Takalo, L.O., et al. 2000, A&AS, 143, 357; Tuorla Quasar Monitoring. I. Observations of 1995-1997. Kühr, H., Pauliny-Toth, I.I.K., Witzel, A., Schmidt, J. 1981, AJ, 86, 854; The 5-Ghz Strong Source Survey. V. Survey of the area between Declinations 70° and 90°. S5 0716+71: Evidence for a Precessing Jet. Nilsson, K., Pursimo, T., et al. 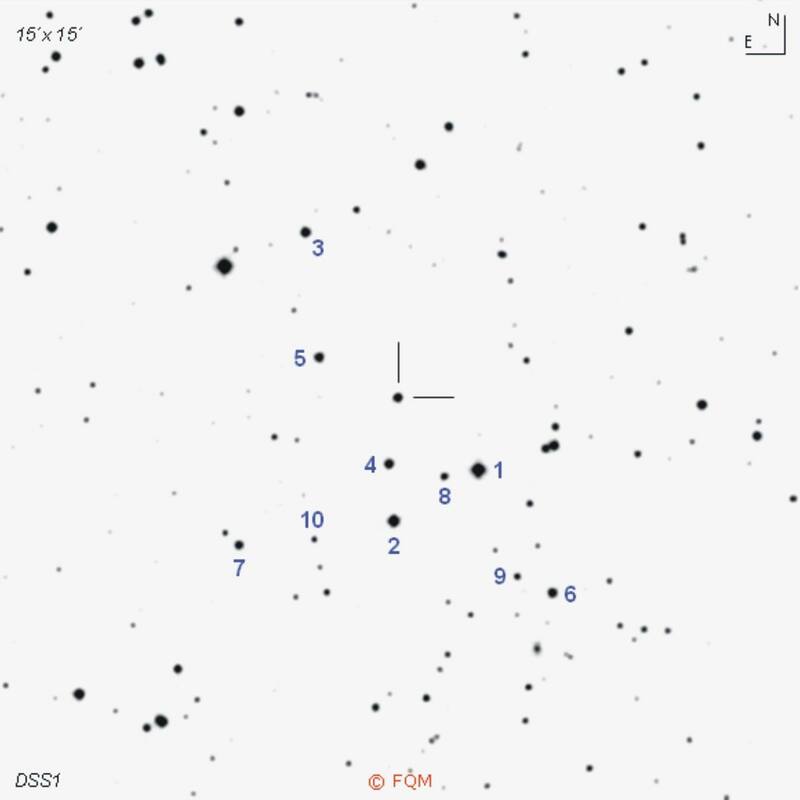 2008, A&A, 487, L29; Detection of the host galaxy of S5 0716+714. Steinicke, W.; Beobachtungsliste für helle Quasare; Umkirch 1999. Véron-Cetty, M.-P., Véron, P. 2001, A&A 374, 92; A Catalogue of Quasars and Active Nuclei: 10th edition. Véron-Cetty, M.-P., Véron, P. 2003, A&A 412, 399; A Catalogue of Quasars and Active Nuclei: 11th edition. Véron-Cetty, M.-P., Véron, P. 2006, A&A 455, 776; A Catalogue of Quasars and Active Nuclei: 12th edition. Véron-Cetty, M.-P., Véron, P. 2010, A&A 518, 10; A Catalogue of Quasars and Active Nuclei: 13th edition. Fields, I: Photometric Sequences for 10 BL Lacertae Objects. Wenzel, K. 2003, SuW 2/03, 60; BL-Lacertae-Objekte. Wenzel, K. 2005, Interstellarum 38, 54; BL Lacertae-Objekte. Eine visuelle Langzeit-Überwachung.